Matthew Etherington (centre) and Simon Davies (right) watch Posh under 18s. Photo: Joe Dent/theposh.com. Peterborough United’s under 18 manager Matthew Etherington has described his own youth team playing days at London Road as ‘among the best of his career’. And now he’s getting a thrill out of helping generate similar memories for the Posh teenagers in his care. Posh under 18 manager Matthew Etherington addresses his players. Photo: Joe Dent/theposh.com. It’s quite an opening statement from Etherington anyway. 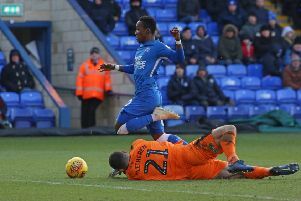 He remains the youngest Posh player in the club’s Football League history thanks to a debut as a 15 year-old on the final day of the 1996-97 season which kick-started a career at top clubs Spurs, West Ham and Stoke. Before that he was a star performer for a Posh team that enjoyed a club record run to the semi-finals of the FA Youth Cup in the 1997-98 season. His current assistant Simon Davies was also a star of that team and he went on to play for Spurs, Everton, Fulham and Wales. 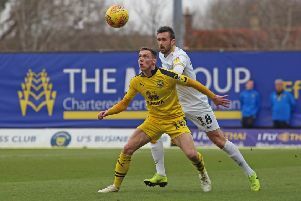 One suspects Etherington, who has just completed his first season at the Posh Academy would feel just as excited if the likes of Kyle Barker and Harrison Burrows travelled on similar career paths. Those two midfielders have recently signed professional contracts. “Some of the best times of my life arrived playing for Posh in the FA Youth Cup,” Etherington admitted. “And I want to use my experiences to help the players. “It’s the same with Simon. We have an excellent dynamic. I do a lot of talking to the group as a whole, whereas he is very good coaching in one-on-one situations. “I’ve been very happy with the progress on and off the pitch. The results have been much better than in recent seasons, but it’s not just about that. I want to see smiles on faces, I want the players to be respectful of everyone they meet on and off the pitch. I want to play passing football and I want us to have our own identity. The players appear to have enjoyed the season. We finished second to Northamption in our section of the Youth Alliance League which got us into the Merit One Division for the rest of the season. Results in that haven’t been so good, but we’ve been using 16 and 17 year-olds in those matches with 15 year-olds on the bench. I am actually excited about next year’s group. “We reached the fourth round of the FA Youth Cup which was an improvement and, although we didn’t do ourselves justice on the night we went out to Bury, they went on to lose to Liverpool in the quarter-finals..
“That night against Bury was the one disappointment as we were flying when we played that game. We’d been winning games and scoring lots of goals, but maybe the pressure affected us as we didn’t perform. “But overall It’s been a good season. I’m in a hugely rewarding job and seeing players progress is why I do it. Harrison and Kyle signing professional forms is very pleasing. “We have a manager in Darren Ferguson who is interested in young players as is his assistant Gavin Strachan. “Harrison has been a standout player and he should be involved more with the first-team next season. Darren likes him a lot. Harrison is gifted on the ball and he has a good head on his shoulders. He’s also improved his work off the ball. “Kyle also progressed well throughout the season. He also has a good head on his shoulders and he’s a very grounded individual. He’s very down to earth.